At Long Pond, the winter day begins. In the morning, a father and son make their way around the pond. On their toboggan is the Christmas tree the father has cut down. 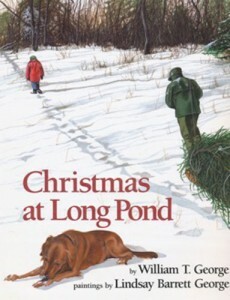 This fourth book brings another season at Long Pond to life. © Lindsay Barrett George. Website by We Love Children's Books.